4More Space prides itself on providing a full range of professional services that reduce hassle and costs across the board. We understand that working in a modern construction site requires flexibility and planning, changing to the needs of the moment while maintaining the strength and integrity of the overall vision of the site plan. Regardless of the scale of your operation, 4More Space are here to provide you with the services you need to get the job done. In particular, 4More Space specialises in modular building systems including the groundwork packages that help to fully actualise a project from the beginning to the end. 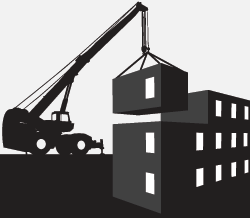 Our modular construction methods are designed to answer the questions of the current construction climate (fully compliant with the latest building regulations), providing solutions to the organisation, implementation, and design of your modular needs. Our modular building groundworks packages include a full site survey so we can meet with you and discuss face to face your exact needs. We can then offer you a comprehensive site analysis and work to help you go from the ground up with the least amount of resistance and delay in the process. Also, if you wish to carry out particular projects yourself, we can supply you with foundation drawings complete with point loadings. Having worked on construction projects across the country, 4More Space understands that every construction site offers its own unique challenges. We have a number of experts that can supply a range of services including foundations, utility services, pathways, access and ramps, as well as landscaping. We also value your feedback, using it to create a service that is even better in the future. Working towards the successful completion of your modular building, we offer services and packages that will fully complete the project at hand. Give us a call today on 0870 803 1965 or alternatively through our contact page and we will be more than happy to review our services and answer any questions you have regarding the process.